Last edited by Andy; 02-14-2017 at 03:44 PM. Excellent, C?ID=211236 confirmed the procedure worked for his replaced steering rack. But I typed too soon, he has some end stop faults. I will update as he tests more. 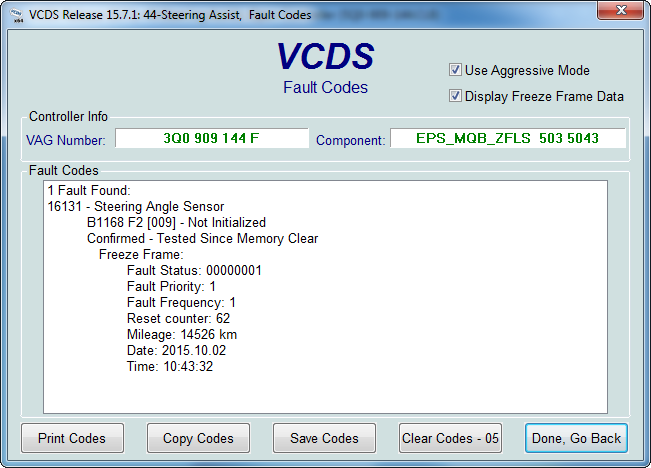 I have the end stop faults and was wondering if you ever figured out what the solution is on the MkVII Golf. Start the car up, make sure that wheels and steering wheel is perfectly straight, go to 44, login, select basic setting of steering angle, then when it's saying "running" slowly turn the steering wheel all way to left, then slowly to the right, turn it back to straight. It should now show "Basic setting OK". Your G85 is now calibrated properly and end-stops faults should go away, if not do the same procedure but choose "learning end stops" in basic setting. Thank you, I tried the first step under "steering angle", but then it made me have 4 new faults and my dash lit up with TPMS, ESC, Steering warning lamps that did not clear driving around the parking lot. I lost the active return function, steering felt really weird. I pulled back into parking lot, did the steering angle sensor reset again (no turning of the wheel) and that cleared the dash warning lights that were on and put my steering back to feeling normal, but it didn't clear the end stop fault... it came back. Just to confirm, when you say "learning end stops", you mean "software end stops"? Also, the status never changed from "running" to "Basic Setting Ok". I SINCERELY APPRECIATE YOUR HELP! Yes I meaned the "software end stops". Also when you will be turning the wheel, hold the wheel until dash beeps or for about 2 sec. in both left and right end positions. Thank you so much. I really do appreciate it! 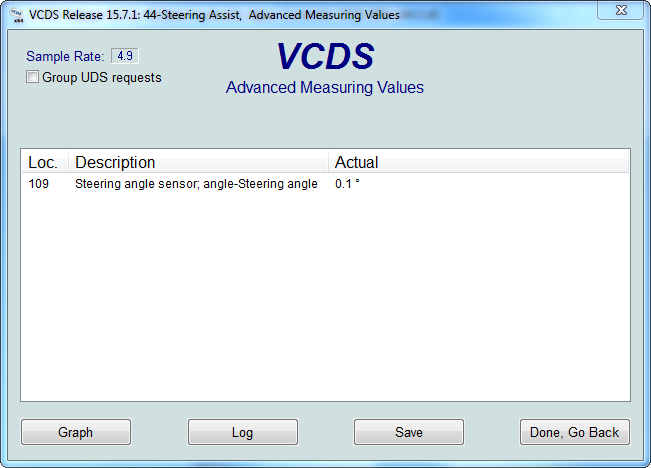 037224 - Steering angle sensor mechanical failure in 03 - ABS. SA code 19249 = Adaptation/Basic Setting Enabling was needed for each basic setting attempt but you can only login once per diagnostic session (or it will error). to say Running and used [Stop] but he still had the ABS fault after a engine restart and lock-to-lock.